We’re sad to report that the death has just been confirmed of Chris Squire, the widely-respected bass player best known for his work with Yes. Chris, aged 67, had been undergoing treatment, in his adopted home town of Phoenix, for acute erythroid leukemia. Squire was one of my favorite bassists in my formative years. His playing on any Yes album from 1970-75 is stellar and influenced many to come. 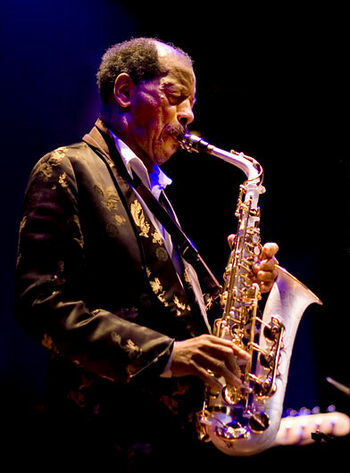 Friends, family and admirers gathered at Riverside Church in Manhattan on Saturday to celebrate the life of Ornette Coleman, the visionary jazz musician who died on June 11 at the age of 85. The service was largely a joyful and music-filled affair with performances and speeches by many well-known artists, including Yoko Ono, Pharoah Sanders, Cecil Taylor and Savion Glover. garde, Olivier Messiaen (1908-1992) was a renowned musician whose boundless wisdom and knowledge nurtured composers like Pierre Boulez and Jean Barraqué at the Conservatoire de Paris, and whose famous students included Mikis Theodorakis, Iannis Xenakis and Karlheinz Stockhausen. He was also an enigmatic composer. John Zorn/Dreamers’ Pellucidar! Dave Douglas! High Risk! Ingrid Laubrock Anti-House III! Thollem/Nels Cline/Wimberley! Blind Idiot God Returns! Anthony Coleman! Schlippenbach/Hubweber/Schubert/Thomas/Kellers! Karl Berger & Kirk Knuffke! Sara Serpa & Ran Blake! John Hollenbeck & Frankfurt Big Band! Frank Lacy & Mingus Big Band! Sean Sonderegger’s Magically Inclined! Motian Sickness! Joan Wildman & Joe Fonda! Ken Aldcroft & Scott Thomson! Helio Parallax! Karin Krog Anthology! Peter Tosh! Waylon Jennings! Lou Reed! Lemon Pipers! And even more..! 6pm: CHRIST PITSIOKOS & Mystery Guests! 2pm: The NU Band: MARK WHITECAGE/THOMAS HEBERER/JOE FONDA/LOU GRASSI + ERHARD HIRT – Rare US appearance of this great FMP Guitarist! 6pm: ROCHUS AUST – Trumpet & Devices/ JONATHAN GOLOVE – Theremin-cello & devices / JOKUBAS AUST – Electric Devices! 6pm: JESSE DULMAN/RAS MOSHE/LEX SAMU – Tuba/Reeds/Trumpet!